区块链日报 - The “Crypto Bloodbath” Isn’t A Bloodbath, It’s A ……. The “Crypto Bloodbath” Isn’t A Bloodbath, It’s A ……. I say “so what” because I believe in Amara’s Law: We tend to overestimate the effect of a technology in the short run and underestimate the effect in the long run. This is part of the reason we get bubbles. We get overexcited about a new technology and we drive up prices beyond any reasonable valuation. This chart shows the meteoric rise of Amazon’s price from IPO in May, ‘97 (at a split adjusted $1.50/sh) to a peak of $105 in April, ‘99. Amazon’s share price went violently up 70X+ in under two years. Was that a bubble? 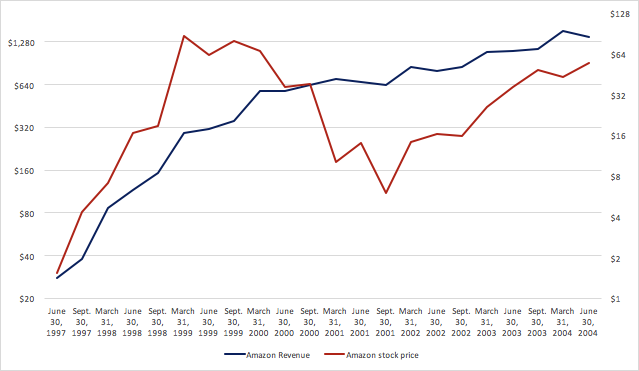 The 2 “s”’s in the brown boxes in the chart above indicate times that Amazon’s share price split. 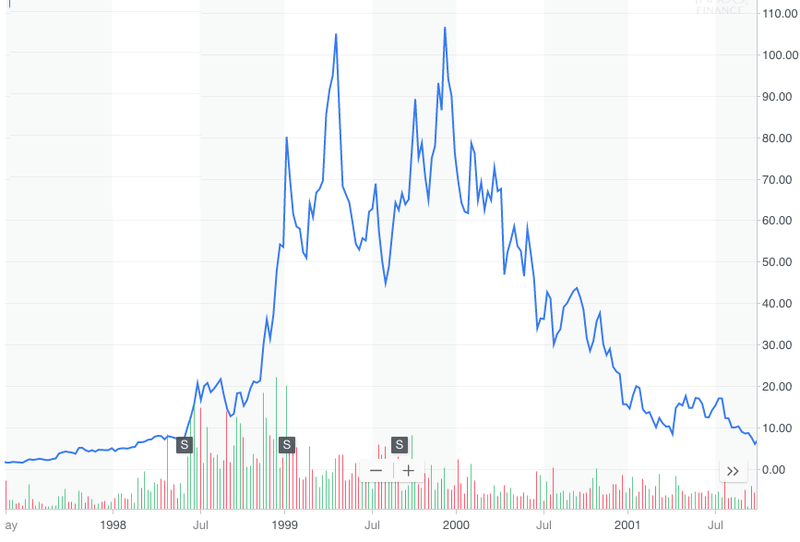 The 2nd chart looked at the implosion of Amazon’s stock price from it’s actual peak in December, 1999, at $106+, to its low of less than $6 in September, 2001. That’s a drop of 95%. Is that a bubble bursting? The 3rd and final chart from that post, which has been updated, show’s that since Amazon’s share bottomed below $6 in September 2001, it is up more than 315X to yesterday’s close of $1,886. From its IPO price of $1.50, it’s up 1250X, generating a 20 year compounded annual return of 40.5%. 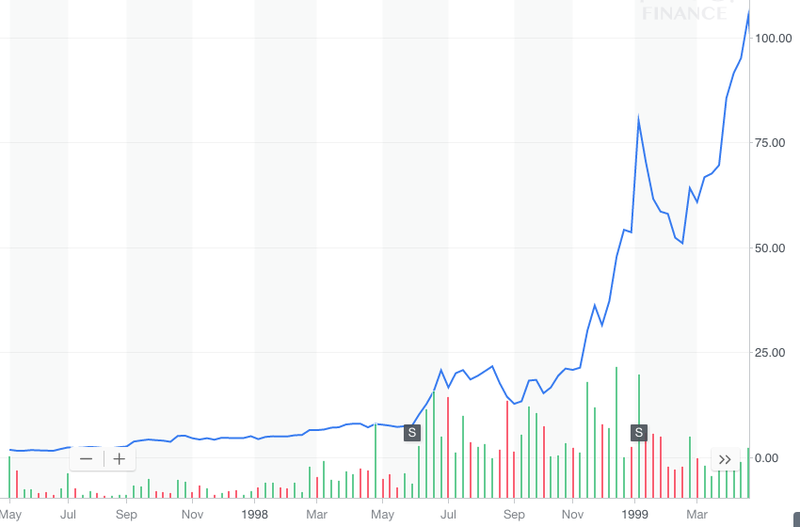 With the perspective of more time, when we look at Amazon’s price chart from 1997–2018, that violent up ‘97-’99 (bubble? ), and violent implosion down ‘99-’01 (a bubble crashing? ), we see it really wasn’t either of those. 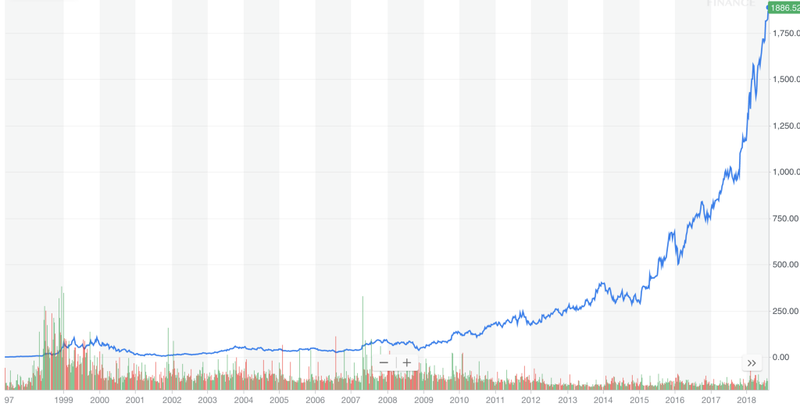 It turns out Amazon’s share price from 1997–2001, when put in to the context of what Amazon became, was just a ……. blip. In 20 years, after crypto has disrupted as many industries as the internet did, we’ll look back at these violent price swings, and the violent crypto price swings certain to come, and they’ll simply be blips in crypto’s long term rise. They’ll be blips in crypto’s massive value creation. 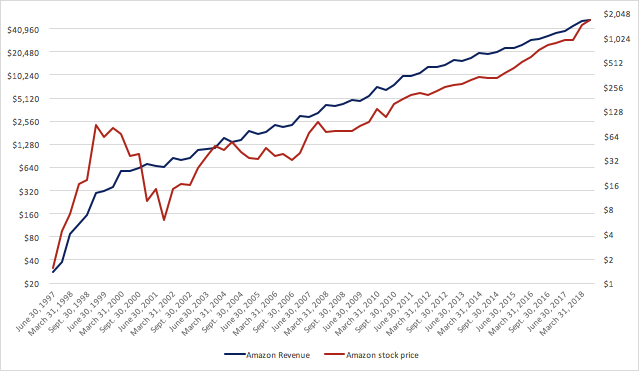 The final graphs below compare the growth of Amazon’s revenue (left axis) vs. Amazon’s share price (right axis). You’d think there would be a high correlation, but it turns out, in the short run, not so much. In the euphoric first year of Amazon being public, the stock price grew at 4X the pace of revenue. The next six years, as revenue grew 400%, the share price fell 40%. As the graph below highlights, the early volatile years, gave way to a less volatile price, more correlated to Amazon’s revenue growth. 5. It Turns Out The Most Important Factor Driving Success In Crypto Investing Is …. In this great TED talk, idealab’s Bill Gross walks through the data driven analysis he did to isolate “The Single Biggest Reason Startups Succeed.” Spoiler alert, it turns out the single biggest factor driving success, is timing. It’s the same thing in investing. It’s all about getting the timing right. For crypto, it’s all about being there during the violent swings up. While there may be some rare people who can time the market, most of us can’t (even though many of us try). So the only way to get the timing right is to be there. Or as we in crypto prefer to say it, the only way to get timing right in crypto, is to HODL. So when we look back at these violent price swings in 20 years, they’ll be blips in the long term rise in value that so many of us feel so certain of. They’ll be blips in crypto’s massive value creation that we get to participate in. And most importantly, they’ll be blips on the path to a better (decentralized) planet. 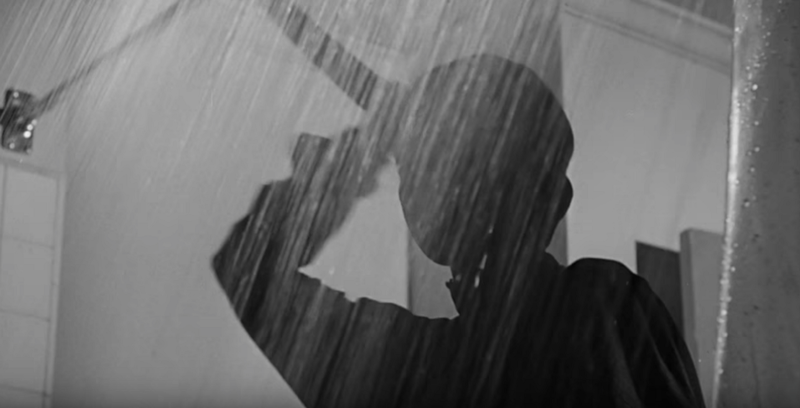 The “Crypto Bloodbath” Isn’t A Bloodbath, It’s A ……. was originally published in Hacker Noon on Medium, where people are continuing the conversation by highlighting and responding to this story.